We are best Medical Gas Pipeline Products Suppliers in Chennai and Medical Gas Pipeline Suppliers in Chennai and offering at low cost to our clients. Chennaihealthcare.net presents an article about a specific topic. The web server used by Chennaihealthcare.net is located in Gurgaon, India and is run by Citycom Networks Pvt Ltd. This web server runs 8 other websites, their language is mostly english. 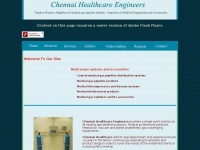 The Chennaihealthcare.net websites were developed using the programming language PHP and served by a Apache server. The website uses the latest markup standard HTML 5. Indexing the data of the website and following hyperlinks on it is explicitly allowed by robot information.